When to Plant Grass Seed? — & More Grass Facts. Scotts Pro EdgeGuard Broadcast Spreader. Pneumatic tires. Do you want to know when to plant grass seed? How to plant grass seed? Best grass types? How to achieve a healthy lawn? What’s the best lawn mower? We answer all of these questions and more. Buckle up, there’s a lot of practical information packed into this article. Enjoy! Every homeowner wants to have a stunning lawn in the back yard with those lovely green classical stripes. However, there is a lot to consider before you rush out to the garden center and buy sacks of seed. The first thing to think about is the overall site you intend to plant seeds, and the second is what you plan to use the lawn for. You may not be aware that there are many different types of grass seed on the market for different situations. For instance, if you have a lot of trees and shrubs in your garden you will have quite an amount of shade. Some grasses will grow well in shade, while others will not tolerate it. You may just want a beautiful lawn so that you can sit in the yard in the sunshine and read a book. Alternatively, you may have noisy kids who want to play ball games and jump about on the lawn a lot. Some grasses will tolerate a lot more rough treatment than others, so if you have kids you need to sow the type of lawn that can withstand it. You also need to consider how much time and effort you are prepared to put into maintenance. Some types of grasses require more TLC than others. On top of that you need to think about the type of weather that prevails where you live, and you also have to consider the type of soil. So you can readily see that rushing straight off to the garden center is a big mistake. However, when you have finished reading this article you will have all the information you need in order to make an informed decision on the right type of lawn for you, and the equipment that you will need to care for it. There are really three types of lawn, and almost all grass seeds are mixes – not just one variety of grass. If you want a “bowling green” look you should be looking for a grass seed mix that is mainly made up of fescues and is probably referred to as “luxury” grass seed. Fescues are fine-leaved grasses that will give you the look that you long for, but be warned: these types of lawn are very high maintenance, and require a lot of time and effort. That is not just time and effort to sow them, but ongoing maintenance for life. Yes, you can have something that looks immaculate, but it is almost going to have to become a hobby! Fescues grow slowly, so will not need mowing as often as other lawns, but that is where the maintenance benefits end. They need aeration on a frequent basis. In order to keep the lawn’s fine looks you will need to hand weed invading “weed” grasses on a regular basis. This lawn will not tolerate any hard wear and tear. It also does not like alkaline soils or clay soils. In short, you really need to be an enthusiast lawn grower to pick this type of seed. The next type of lawn is what might be described as a lawn for landscapers. This will usually be a mix of five or six different types of seed which will grow well in most soil conditions. It is a strong grass that can take a certain amount of hard wear. Obviously, it will need regular mowing, and it will need a feed perhaps once a year. As for scarifying and aeration, this will probably only need to be done once every three years. A lawn that looks great yet is not too demanding. Thatch will eventually destroy your lawn by clogging up the flow of nutrients. (At this point, we should assume that you don’t understand the term “scarifying” or “dethatching.” What that means is cutting out dead “thatch” which is grass stems and roots that have died, and other debris, and are building up in the lawn, preventing moisture getting into the soil. You can buy machines that will do this, in the same way as you can buy a lawnmower to cut the grass. Aeration, rather obviously, is a means of getting air and also water into the soil. This can be done manually in the fall by prodding a garden fork into it, which is time-consuming, or it can also be achieved by using a dethatcher. Scarifying is a British term. Electric, with 5 position depth control. No maintenance. A dethatcher uses blades which cut vertically into the grass and into the ground. It removes thatch, and also lets water and nutrients into the ground. In addition, it has the same effect as pruning a shrub: it cuts off the edges of the roots, encouraging the grass to produce more roots and grow thicker. Raking, or de-mossing, is another chore. Moss will begin to grow on your lawn, and needs raking off, otherwise you will finish up after a few years with all moss and no lawn. Raking can be achieved by using a spring-tine wire rake, which can be tiring, or again, you can buy a machine which will do it a lot more easily). Learn more about thatch by reading our article on the GreenWorks 25022, where we cover this topic in depth. The third type of lawn is the one that you will want if you have kids and/or hold a lot of barbecue parties. Usually a mix of various rye grasses, but rye grasses don’t like salt air or very wet areas, so it may not be for you if you live by the sea. (For a similar type of lawn in these areas you could use a mixture with a rhizomatous tall fescue in it). It just needs regular mowing and a feed once a year, but is otherwise quite undemanding. For very dry or shady areas, you will need to look for a seed which will tolerate these conditions, but a lawn will still need some sunshine, so if you live in woodland which is very dark, then a lawn is not for you. Tall fescues will do well in dry conditions, since they have longer roots than other grasses and can survive on poor, stony, or sandy soils, but they are not very hard-wearing. Bear in mind that most grasses will not like acidic soils, and it may be necessary to add lime to the soil in order to change the pH level. The pH level is a measure of the acidity or alkalinity of a soil, 7.0 being neutral. Below that is acidic and above is alkaline. The ideal pH level for most grasses is between 6.0 and 7.0 so if your soil is more acidic you need to add lime which will increase the alkalinity. You can buy a very simple test kit at the garden center in order to check the pH level of your soil. An acidic soil will mean that some nutrients are not available to the grass so it simply will not grow so well. In fact, some grasses will not grow at all in an acidic soil. Adding lime to the soil before you sow will increase the pH level. There are different types of lime, some containing calcium and others magnesium. Either of these will benefit soils that have deficiencies. Again, soil testing can indicate deficiencies of certain nutrients. Don’t overdo the addition of lime, because you don’t want the pH to go above 7.0. Your garden center staff should be able to tell you how much to add to achieve the pH level that you need. This is where the hard work really begins, but soil preparation is critical for the long term if you want the lawn of your dreams. If there is an existing tired old lawn that you are replacing, the best thing is to kill it all off with a spray of glyphosate. This will kill off everything including weeds. The next job is to remove the existing turf because it will not break down easily when you rotovate or dig over the area. If you have space, pile it and leave it to rot down into compost which you can use in the garden later. 8″ tilling depth. 6-Inch Or 10-Inch Tilling Width. Best for small lawns. Next you need to dig or rotovate the soil to a depth of about 8 inches (20 cm), removing any stones as you go. Break up any large clumps with a garden fork. A rotovator is also known as a cultivator or tiller. I know, it’s confusing. A rotavator is generally a heavy-duty machine, used to cover large areas. Heavy clay soils do not drain well, and if you have this type of soil you may need to bring in some loam soil. Cultivate it into the soil as deep as you can. Add another layer and cultivate that in, but not as deeply. Then add a third layer on the top. This should provide a nice friable finish ready for seeding. However, there is another problem. All this digging and cultivating will have brought weed seeds to the surface. Give the area another spraying of glyphosate which will kill them off, leaving it for about two weeks before further action. Improves the absorption of nutrients and water for a healthy lawn. Now you can add an initial layer of fertilizer and rake it into the soil. Next you need to tread the soil surface which is simply walking on it, pushing down or “heeling” as it is also called, with your feet. It is very tedious, as in effect you are shuffling along in lines up and down but it has the effect of pushing out air pockets. Ideally, you will tread the soil twice, the second time at right angles to the first. When you have done this, you will need to rake over and level the surface once again, and then (hooray!) you are ready to sow. But you did want a perfect lawn, didn’t you? Let’s take a quick look at some of the various types of grasses available. Bermuda grass is good for your lawn, for a golf course, and for pasture for your cattle. It doesn’t mind salt air and has long roots so is happy in dry areas. It is quick to establish, and is also resistant to insects and diseases. Zoysia is a hardy grass that will establish quickly, is hard wearing, and will also do well in the northern part of the country. It grows very quickly and produces a dense lawn that will keep out weeds. However, it can quickly invade your flower beds and borders, and turns into a tan or brown shade in the winter. St. Augustine is native to the Gulf coast and is widely used in Florida. It needs plenty of water, and does not like heavy traffic. It produces a thick growth, but is also subject to pests and diseases. Like Zoysia, it also turns brown in the winter, recovering in the spring. It is reasonably shade tolerant. It’s almost impossible to produce St. Augustine grass seed reliably and consistently, which is why you are unlikely to find it in stores. Learn more. St. Augustine is a unique grass that does not typically produce viable seeds like other types of grasses. St. Augustine grass needs to be grown vegetatively using sod or plugs. Centipede grass is very low maintenance and extremely hard-wearing. It’s a very good grass for those who have kids and want something that will look good and take all the punishment that they can give it. It does not need a lot of watering, feeding, or mowing, and does well in anything from clay soils to sandy. It forms a dense mat and will choke out weeds. It is an expensive seed, but suitable for those who want a lawn that needs little attention. Bahia grass was introduced from Brazil in the early 20th century. It is a good all-round grass and has the ability to withstand periods of drought and recover. Bahia grass is also fairly low maintenance and has become popular for that reason as well. Kentucky Bluegrass is extremely popular in North America and has a fine texture. Long roots mean that it can tolerate drought. It is also reasonably moderate in its’ maintenance requirements, although it grows fairly quickly so will require mowing more often than some lawns. It will not withstand very heavy traffic, so is not suitable for a lawn where kids are going to play. There are so many different grass seed mixes available that it pays to do a search on Google inputting the main things that you want your lawn to tolerate, including salt air, drought, wet, shady, soil type, and so on, together with the sort of wear you need and how much maintenance you are prepared to put in. With that said, you can also go and talk to your local garden center staff who will be knowledgeable about the type of lawn that you want to create, and may very well have in stock the sort of seed that you need. If not, they should be able to get it from their suppliers. So, now that we have some idea about the different types of lawn that you might want, and the different types of grass seed available to achieve it, there are a lot of other questions to which you will need answers. For instance, when is the best time to sow lawn seed? How do we sow it? What is hydroseeding? When to Plant Grass Seed? To begin with, when is the best time to plant grass seed? The answer is in the spring or fall, but definitely not in the summer. The reason is that in the summer when the weather is hot it is very difficult to keep the soil moist enough in order for the seed to germinate. In late spring, depending where you live, the soil will have warmed up, yet it is not too hot, and in the early fall the soil is still warm, but is beginning to cool down. Given the choice, we would always plump for the fall. This gives the seed a chance to grow away and get established before the weather gets too cool, yet it is not too hot and dry. There is another problem with sowing in the summer which is that when you prepare the soil you open it up to weed seeds which will germinate rapidly and compete with the grass seed. There is an interesting point here in that weeds will always grow in the conditions to which they are most suited. As gardeners, we want to grow the plants that we want to grow, which may not flourish at their best under the conditions which we have. Take rhododendrons as an example. They will simply not grow in alkaline or chalk soils. They prefer acid conditions. So they will grow wild and very successfully in acid soils, but you will never see them growing in alkaline soils. They choose to grow in the conditions best suited to them. In fact, if you plant a rhododendron in alkaline soil it will die. Other plants will not grow in acid soils, many grasses among them. This applies to many other plants. So weeds will grow where they flourish best and can germinate and grow fast. This is why weeds always do well wherever they are: they are growing in ideal conditions. Not the same weeds all the time everywhere, but weeds nonetheless. What this means is that whatever weeds grow in your locality will happily sprout in the soil which you have just prepared for your lawn! So we need to sow when the weather is less perfect for them to grow. What we are doing as gardeners is trying to grow the plants that we want to grow, some of which may simply refuse to grow in the conditions that we have. How do we sow lawn seed? It rather depends on how big an area you want to sow. A small area can be sown by hand, using roughly 16 seeds to every square inch. (There is no need to count them exactly, but too many will cause them to fight for nutrients and water). A larger area can be sown using a fertilizer spreader. In order to seed evenly, it is best to seed in four different directions, covering all of the ground. It is a bit time consuming, but you only have to do it once. Try not to go right to the edges of the area to be seeded, otherwise you will be spreading seed (and wasting it) on pathways and drives, or possibly into flower beds. Leave the last 30 cm or so and finish that area by hand. What is the best seed spreader? One of the simplest and least expensive seed spreaders is the Scotts Turf Builder (EdgeGuard) Mini Broadcast Spreader. This is basically a hopper on wheels which you use to distribute the grass seed evenly over the selected area. One of the big advantages of the Scotts spreader is that it has the Edgeguard which blocks the seed from spreading on the right hand side of the spreader, which means that you don’t spread your grass seed on to pathways and flower beds – a very big benefit. You don’t really want grass growing in amongst your prized flowers and shrubs, nor in gaps in a block paving path or driveway. Also, the Scotts Turf Builder is inexpensive. Another model is the Agri-Fab 45-0462. This is a very high quality machine that runs on a set of smooth-rolling bearing-mounted wheels and has a corrosion-resistant poly hopper which lets you use materials that would cause damage to a metal hopper. The hopper itself will hold up to 130 lbs of grass seed and will spread over areas of up to 25,000 square feet. It is, however, a bit more expensive than the Scotts Turf Builder. However you sow your seed, you also need to add a starter fertilizer if you didn’t do this at the soil preparation stage, in order to get the seeds germinating fast. Around three to four weeks later, you need to add a second layer of fertilizer, as the watering that you have done will have washed the starter layer out of reach of the young roots. Once you have spread the seed, you need to water with a fine mist, ideally twice a day if it has not rained, for the first couple of weeks in order to get the seed germinating. After that, you can reduce the amount of watering to once a day, and gradually begin to increase the amount of water used. In month two, you can cut watering down to twice a week (again assuming it has not rained in the meantime) using more water, and in the third month once a week should be sufficient. A new lawn is liable to dry out at any time in the first six months or so. What is hydro seeding? Hydro seeding is where in effect you spray the seeds mixed with water and a fine mulch, together with fertilizer, on to the lawn area using a special machine. It is a lot quicker than other methods, because you can do everything at once. However, for a small area, the cost is probably not worthwhile. For larger areas, it will save a lot of hard manual work. When Can You Use Your Lawn? When do you start to mow your new lawn, and when can you walk on it? This depends on the type of grass seed that you have used. The fastest grass to germinate and become established is rye grass and it can take as little as two months. Other grasses may take up to three months or so before it is safe to start using them. What about mowing? When the grass reaches about 5 cm is when you can give it its’ first cut. Set the mower blades at the highest level so that you don’t remove more than about 2cm, and don’t mow when the lawn is wet. Be gentle: it is a BABY! Make big, wide turns with the mower, or do a three point turn. After you have cut the lawn about four times you can gradually start to bring the mower blades lower for the next four to five times until you get to a height of 2 cm. Stay at or above this level for the first six months. What about weeds? It is almost impossible to sow a new lawn without getting some weeds in amongst it, but many of them you can pull out by hand. Just remember to firm down the surrounding grass with your foot. In some instances it may be necessary to use a weed killer, but not all weed killers are suitable for newly established lawns. If in doubt, check with your local garden center staff or on Google. So what sort of lawnmower should you buy? You basically have a choice between a push reel mower, an electric mower, a battery mower, and a gas mower. Let’s begin with a push mower. It is going to be cheap – no doubt about that. Probably under 100 bucks very often, but even the more expensive ones like the Fiskars will cost less than any power mower. One of the problems, if you can call it that, is that a push mower is powered by you. In one sense that is an advantage, because it gives you some exercise, and that is something that many Americans do not get enough. However, it rather depends on the size of your lawn. If it is relatively small, it may be no problem. However, if your lawn is large and it is going to take a couple of hours or more to mow you may prefer to use a power mower. The longer the blades and the bigger they are, the heavier the mower will be to push. This type of mower also usually has no collection feature for the clippings, so they spray out either at the rear or the front of the mower as you push. If they come out at the rear, your feet will get covered in clippings. Of course, push reel mowers do not produce any pollution, so they are more environmentally friendly than power mowers, and in addition they are considerably quieter. This is an advantage if you want to mow the lawn early in the morning or late in the evening. With a power mower you can annoy the neighbors if you mow too early or late: this may mean mowing during the middle of the day, which is OK if you live somewhere that doesn’t get too hot, but if you live in Florida when the sun is blazing it is not so funny. Push mowers are also simple machines. No engines to service, no starter cords to pull (frustrating when they decide to be difficult), and no gas or electric to pay for. They are also better for your grass in that the way they cut is in the same way as a pair of scissors, just snipping off the top of the grass, where a power mower’s blades spin like a helicopter blade tearing at the grass, which actually makes the lawn more liable to disease and/or insect pests. Push reel mowers are also safer than power mowers. Believe it or not, around 75,000 people in the US are injured in lawn-mowing accidents every year and there are 75 deaths. Yes, mowing the lawn can be dangerous! Let’s move on to electric mowers. These can be either mains operated or battery powered. If operated from the mains, you are limited to how far you can go by the length of cable that you have. For obvious reasons, these are not much use if you have a very large lawn. In addition, you have the problem of the cable: it is quite possible to run over the cable and cut it, which does happen and is, of course, extremely dangerous and possibly fatal. You need to operate a mains powered mower with extreme caution. Battery operated mowers are much safer, but they have a limited run time. 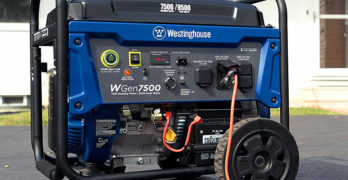 Some of them will only operate for around an hour, which is not much use if you have a very large lawn since you don’t want to have to re-charge the battery halfway through. In addition, both mains powered and battery powered mowers may not cut the thicker grasses such as fescues so well. This could mean raising the cutting height of the blades which in turn might mean that you have to mow the lawn twice, once on a high setting, then on a lower one in order to get it to the level you wish. However, those disadvantages aside, there are some benefits. You don’t have to buy gas, or change the oil and filters, nor replace spark plugs. They are also much quieter than gas-powered mowers and more eco-friendly. Gas powered mowers are in general heavier machines, but they will cut through thicker grasses easily and they can handle any size lawn since they are not limited by a cable or battery life. However, they are very noisy compared to other mowers and they emit a lot of pollution. They also require routine maintenance, and they can be difficult to start with their pull-cords. For a very large lawn, of course, you might choose a ride-on mower which most owners consider a lot of fun. However, they may be difficult to get into very small areas or around trees or shrubs that are close together, so you might need a push reel mower or strimmer for these tight corners. Finally, we’ll take a look at some of the different mowers that you might want to consider. 60% easier to push than other push mowers. First up is the Fiskars StaySharp Max Reel Mower. This push reel mower is claimed to be 60% easier to push than other reel mowers and is suitable for the smaller lawn. It doesn’t produce any pollution whatsoever (other than that created during manufacture) and doesn’t require any ongoing maintenance, even to the extent of sharpening the blades every year. Eventually they will need to be sharpened of course, but not for several years. The InertiaDrive reel is claimed to deliver twice the actual cutting power of other reel mowers and can deal with twigs and other things on the lawn that would stop other mowers in their tracks. It will cut all types of grass, including the tougher ones such as Bermuda, Augustine, and Zoysia, and the cutting height adjusts from 1” to 4-inches. The wheels are inset, which means that you can cut right up to the edge of the lawn, and the clippings are thrown forward so they don’t finish up on your feet. Of course, you don’t need any gas or electricity so you save on that over the years, it is almost silent in use, and it doesn’t need replacement oil filters, spark plugs, and so on. You also don’t have to fume over a pull-cord starter that sometimes refuses to start: you just get up and push. At about 250 bucks this is not the cheapest of push reel mowers, but it comes with a three year warranty and should last you a lifetime. Great design makes this one of the most popular lawn mowers. One of the first things that you should note about this mower is that before you can use it you need to purchase an outdoor rated extension cord. The cable on the mower is about a foot long. For a yard of less than 40’ you need a 16 gauge cord or for longer than that you can use a 14 gauge. At 56 lbs in weight (about the same as a sack of potatoes) it is quite heavy, but that is because the 20” cutting deck is made of metal. It is extremely maneuverable and the single lever on the right hand side allows for seven different cutting heights from 1.5” to 3.75-inches. The 12 amp engine is strong enough to cut heavy grasses like fescues, and you have the option to use the grass collection bag or side discharge if you want to mulch the lawn. Of course, being electrically powered it doesn’t create any pollution and it doesn’t need any gas, oil, replacement filters or annual servicing as a gas mower does. Gas mowers in the US get through 800 million gallons a year – that’s a lot of oil and a lot of pollution. One unfavorable comment is that the factory engineered blade is not as sharp as it could be (hey, it’s made in China, but then everything is these days) and you would do best to sharpen it as soon as you receive it. However, it has over 450 reviews on Amazon with a VERY favorable rating, and the recommended retail price is only $229. Apparently, it is often available on Amazon at very deep discounts on that. Dual cutting blades. Comes with 2 Li-ion batteries. This is a battery powered mower which means that you don’t have a cord dangling from the back of it with all of the inherent risks of cutting the cord. At the same time it emits no pollution and it doesn’t need gas, oil, replacement filters, or an annual service, although keeping it clean after use is obviously advisable, and the batteries need to be recharged. This mower has twin motors, each of which drives a 10” blade, giving an overall width of 20” which produces finer clippings, which in turn break down more easily. It also has two Lithium-ion batteries one of which is 73Wh and the other 146 Wh. The smaller power battery takes about an hour to fully charge, while the other takes two hours. If one battery runs out of power while you are mowing, the machine automatically switches over to the other one. However, you don’t need both batteries on board in order to operate the mower. You can choose between mulching or rear discharge into the cuttings bag, but there is not a side discharge feature. The blade height is adjustable by using a single lever and can be from 1 3/8” to 3 3/8”. The mower has an interesting power saving feature whereby the twin blades do not spin at the same rate all the time. When they hit tougher grass, they will speed up. The idea is to increase run time in the power saving mode. However, some users have said that the mower struggles a bit when it hits really dense grass. However, most cordless motors suffer the same problem: it may just need some extra passes in order to achieve the desired cut. Overall, the reviews of the GreenWorks 25302 Twin Force G-MAX 40V are extremely favorable. Three cutting modes: collection, mulch and side discharge. This is a fairly basic gas-powered mower that will deal with just about every type of grass, no matter how dense. It employs a 140cc Briggs & Stratton engine – and there is not much about lawn mower engines that Briggs & Stratton doesn’t know. It doesn’t use huge quantities of gas, and the pull-cord starter usually gets it fired up the first time. The mower comes completely assembled from the factory, only needing the handles attached which takes less than five minutes. It has a 21” cutting deck – larger than many mowers – which means that fewer passes are required to mow the lawn. A single lever adjusts the cutting height into one of five different positions. As with many modern mowers, you can make use of the collection bag, side discharge, or mulch. Yes, being a gas-powered model, you need to winterize the motor, but once done it will sit happily until the spring. Furthermore, you can use it on wet grass if need be, since there is no danger of the conflict between electricity and water. The Husqvarna 5521P 21-Inch 140cc lawn mower is a very easy to use and reliable model. 4-point, 9 position cutting height adjustment for varying lawn conditions. Certainly, as you now know, creating a lawn from scratch, or replacing an old, tired, worn-out one, is not an easy task if you are going to do it properly. However, if you put in the time and effort at the beginning you will reap the rich rewards for many years to come. There is no reason that your beautiful new lawn should not continue on for the pleasure of your children and your grandchildren, provided you do it correctly. It’s hard work to get it started, but the rewards are well worth it. You probably arrived at this article wanting to know: When to plant grass seed? My hope is that you know a whole lot more than what you knew before reading this article.